Jane is sleeping, comfortably, I hope. She is probably warm, at least, what with a down comforter and an electric throw. I think she'll sleep in late. I slept well for a few hours and fitfully for another one or two. We may not even get underway today at all and that would be fine with me. We are exhausted, sore, shaken and deeply chastened. We came far too close to doing severe damage to Joy several times last night. Our misadventure was the perfect storm of naivete, hubris, and bad luck. A combination that costs people their ways of life if not their very lives. We are lucky to have gotten off as easily as we did. The underlying fault was our own; we miscalculated the time needed to make our next passage because we forgot to take into account the effect wind direction would have on our speed, even when motoring. The passage from Deltaville to Kiptopeke State Park was about 27 miles, as Jane had first plotted our course. We had already made a couple of passages approximately as long and they took about 4.5 hours. So leaving just after noon, seemed like cutting it a little close, but we were feeling pretty confident about our anchoring skills already, and assumed we'd be dropping the hook right around sunset. What we neglected to take into account was how much slower we would go with the wind on our nose--4.8 versus the 6.9 to 7.1 knots we'd made previously: enough of a difference to ensure that we wouldn't make landfall until after sunset. 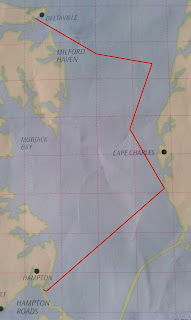 If that wasn't foolhardy enough, we exacerbated the problem when I suggested that instead of going on a straight diagonal, we cut east across the bay and then alter course to the south closer to the eastern shore. We'd been motoring into the wind for two days and I was tired of the constant bucking. Jane was not of the same opinion but made the concession to me. It helped for a while, until we switched courses, but in retrospect, it wasn't worth the hour it cost us. 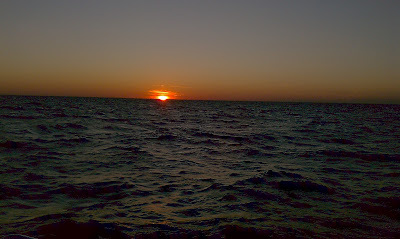 Our first sunset at sea, sadly unwelcome. At 3:30 Jane realized our mistake and was rightfully worried. I less so. But I can't fault her for that: she doesn't have to rely on what I do...her. I have enormous faith in her ability to see us through whatever trouble we get ourselves into. The sun set an hour and a half before we made the turn to the anchorage--or tried to. Just as we were clearing the barrier "sunken concrete ships" which to us were only lacunae in the light reflected water, we saw by our steaming light, a row of pilings coming straight at us, too late to avoid them. "REVERSE!" I screamed to Jane. Then she saw them too, threw both engines hard into reverse in just time to stop us from plowing into them head on. Instead we pivoted away and took four or five of them across our starboard side. Since the current was oncoming, I can only think it was our own momentum that forced us back into them a second and third time. It seemed we couldn't get away. She was sure our starboard prop had been caught on something, but I kept screaming at her to keep it in reverse, she did and finally were were free. Free, but homeless--and scared witless. We never saw those pilings coming and they weren't depicted on our chart. What else might be our there in the dark? The thought of trying to maneuver between the "concrete ship" barriers to go back in was out of the question now. For a few moments as we slowly motored back northward, not knowing what else to do, we considered waiting for the full moon to rise, to see if that would be sufficient to light our way. We shortly realized that it wouldn't. 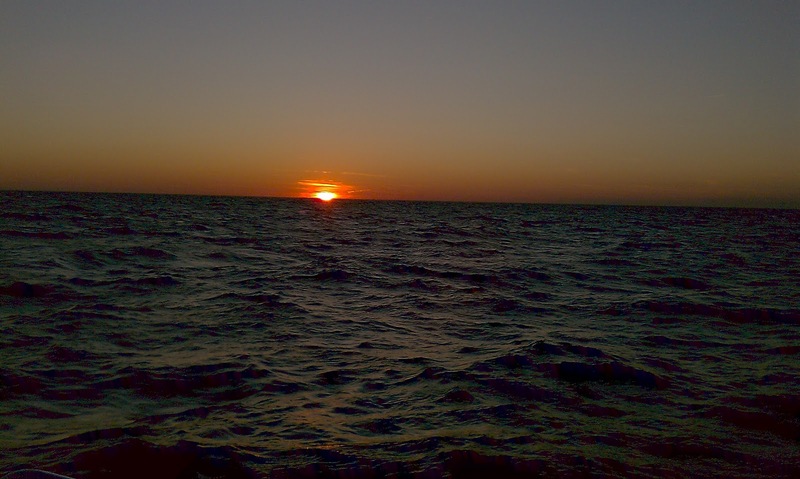 "I don't care if we just wander around in open water until dawn," I remarked to Jane. But, that wouldn't be safe either and we didn't have enough fuel for that many more hours, regardless. Jane first and then I took turns looking at the guide book in the hopes of finding an anchorage that we could manage in the dark. We opted for Old Comfort Point for it's navigability. Jane laid the course in on our chart plotter and back across the bay, another 14+ miles, and more than 3 hours, across two big shipping channels in pitch blackness we went. Bucking again at 4.4 knots, it seemed as though we were in a power boat. "So what are all the things you are afraid of right now." I asked her at one point, partly to be thoughtful, but mainly to pass the time. "I'm afraid we're going to run into more pilings, I'm afraid we're going to run into a big ship, I'm afraid we're going to run into a sailboat, I'm afraid we'll miss the anchorage, I'm afraid we won't be able to maneuver into it, I'm afraid the water will be too shoal, I'm afraid you'll fall overboard, I'm afraid I'll fall overboard. That about covers it." ....It turned out her list was an incomplete. "Well look at the AIS, "I tried to say as gamely as possible,"do you see any big ships?" She did. A tug off to port that was due to cross our bow a quarter mile ahead of us. It looked only like a break in the string of lights that spanned the Chesapeake Bay Bridge-Tunnel. A quarter mile seemed way too close for comfort to me, but Jane pointed out that that was a pretty spacious distance considering we were were crossing one of the busiest shipping channels in the world. Sure enough, the blackness glided across our bow and took something between form and negative space just ahead of us. We'd been motoring for over eight hours at that point and were cold and tired and very frightened. Out in open water it was big ships, which at least we could see on the AIS; sailboats typically don't carry transceivers and so don't show up. We'd just have to hope they'd show up on our radar in enough time to take evasive action. Closer to shore it was obstructions like pilings, duck blinds, day marks. I periodically considered but chose not to mention the possibility of crab pots at the shallower depths in between channels. I just hoped there weren't any. We'd made it across the bay. Jane only half-jokingly reminded both of us to keep a look out for pilings cause it looked as though we might survive the night. A few flashing buoys later, we passed the light at Old Comfort Point, a sector light flashing yellow on the good, deep water side and red on the shallow side of the point. We saw the yellow flash long before we could make out the actual light. Aptly named, I thought, feeling quite comforted at seeing it. Not a minute later, our AIS system alarmed. We were on a collision course with something we couldn't identify visually. While Jane was trying to spot it in the channel, our port engine alarm sounded signaling that it'd cut off, an eventuality Jane hadn't thought to add to her list. Assuming the auto pilot couldn't hold a course with one engine, she put it on "standby" and told me to steer while she figured out what we needed to do to avoid colliding with the a ship we couldn't see. At the same time, we had a green lighted buoy coming up. The chart indicated it was close but we couldn't see it anywhere. It was not more than 20 feet away when it came into view under the boom. Jane took the wheel again and had put it back on auto pilot. (I'd reminded her that Steve and Rene', Joy's previous owners, rarely motored on both engines.) "STARBOARD, STARBOARD!" I yelled. "You're about to hit that green!" "Right here, right look under the rigging!" "Look under the rigging, UNDER the rigging!" "Oh, Jesus!," she screamed, bearing off just in time. We were shaking with cold and with adrenaline, not sure how much more we could take; increasingly certain it wasn't over. The only good news was that by nearly hitting the buoy, we inadvertently altered course out of the way of the ship we hadn't been able to see. As slowly as we could and still have steerage, we navigated around the point to the anchorage. The water had calmed considerably, but was still rollier than we ever anchored in. Only one more green mark to go, but it was a day mark. I was looking out for anchor lights, or any indication of other ships in the anchorage while Jane looked for the green mark and monitored our depth (reported to be good all the way in). Again, only by a few feet did we avoid crashing our port hull into it. We saved our boat, but were ourselves wrecked. The anchorage was wide and deep--too deep. We kept getting readings of around 17 feet--a lot of chain to drop quickly with a wind blowing us back down and with only one engine we had no way to keep from spinning. We edged closer to the Hampton Roads Bridge, exchanging shallower water for louder traffic noise. Finally we reached 10.3 feet. Jane told me to get ready, but I was already more than ready. I'd discovered that by putting my foot against the windlass chain feed, I could keep it from jumping out of the track, so I grabbed Jane's headlamp, jammed my foot against the guide and didn't even wait until we were completely momentum free. What makes for good holding ground makes for a very muddy anchor chain and our last few nights' anchorages left us with a chain so caked we had no hope of reading the color-coded length marks. So I let out it out as fast as it would go hoping that it would grab. It did. We changed places and commenced our barely acquired anchoring ritual: Me at the helm, Jane at the bow. I backed down on it slightly with our starboard engine. It held. Jane put the snubber on and I backed down on it harder for a full minute. It still held. I let out another few feet to hang slack behind the snubber (Joy has three sets of windlass controls). "10.2, 10.3, 10.2, 10.1, 10.2..." I called up to Jane to let her know were weren't drifting back onto the marina. We were set. Our fourth time anchoring was in 10 knot winds after a 12 hour day of motoring into bucking seas, six of which was spent in total darkness. Joy's starboard side is badly scraped, but probably only cosmetically. We don't know why our port engine died. I could look at it but probably don't have what I'd need to fix it, even if I could figure it out. We are sadder, but wiser, and wish we hadn't been so desperate to get warm. Our next anchorage, in Portsmouth at the start of the ICW is 10 miles away. On we go.